“In my tests, not having holes all around the brake effects accuracy a bit. I believe it does something to the bullet by the air pushed ahead of the bullet creating unequal turbulence in the bullet path. 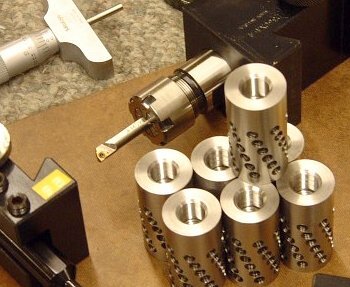 I’ve tried a few brakes where I drilled only holes on the top, test fired, and then completed holes on the bottom and in every case, accuracy improved.” Below you see some spiral-ported brakes crafted by Clay Spencer. 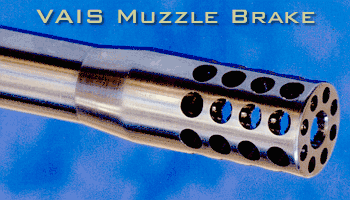 Share the post "Muzzle Brakes–Bertalotto's Test Results"
We mentioned this item before in the Bulletin in September. Well now MidwayUSA has brought back the super-low price through the end of the year. 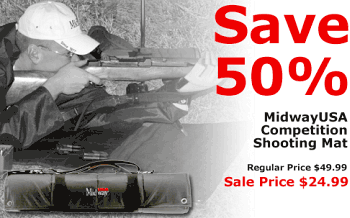 Midway’s 69″ x 27″ Shooting Mat (item 169107) is now 50% off, marked down to $24.99. It has pads for your elbows, plus corner grommets so you can stake the mat down–a nice feature on those windy days. The mat rolls up into a nice, compact, 6″-diameter package. The Midway unit is not as thick as more expensive, deluxe shooting mats, but then it costs one-third the price. USER REVIEWS are quite positive for this product. Share the post "Shooters' Mat on Sale for $24.99"